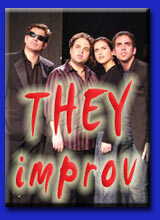 THEY improv constantly looks for ways to give back to the communities we serve. With a variety of improv comedy, game shows and murder mystery dinners for fundraising for a variety of charities, THEY improv's Comedy With a Cause and Justifiable Homicides have helped raise tens of thousands of dollars for worthwhile causes. We have found that giving of our time comes back to us in a myriad of ways and we love trying to help when we can.. Helping charities across the country raise the money that they need is a tough proposition. A comedy fundraising charity event can help raise money through laughter in the face of adversity. THEY improv is focused on doing just that, and has proven successful for many charitable organizations. Whether you are in New York, South Florida, California, Las Vegas, Boston or Chicago, THEY improv can put together charity event entertainment for your organization. Here are a few testimonials from just a handful of our happy charitable organizations. I wanted to thank you and They Improv for the great performance at our American Cancer Society's Relay For Life fundraiser on February 9th. As a Valentine comedy and live music evening, we had a terrific turnout and the crowd enjoyed both the music and the improv tremendously. This was a very successful fundraiser and on behalf of Team Mission Not Impossible and myself, I want to thank you for your continued support. On behalf of The Reach for the Stars Foundation, I would like to thank you for participating in our 'Laugh Fest' event held at the IMPROV Comedy Club located in the Seminole Hardrock Hotel & Casino in Hollywood, Florida, featuring (you all) Broward County's improv troupe; THEY improv. Your performance at the event is greatly appreciated and will aid towards achieving the foundation's directives of helping those in need. THEY improv definitely brought out the Stars to Benefit The Reach for the Stars Foundation! Everyone thoroughly enjoyed the evening!! I look forward to us working together in the future! Once again, thank you for your support of The Reach for the Stars Foundation. On behalf of the Multiple Sclerosis Society Upstate New York Chapter I would like to thank you and the staff at THEY improv for your outstanding work with our Murder Mystery Team Captain Rally on April 10th, 2008. The event was a huge success and the participants had a fantastic evening. With your help and creative ideas we managed to get almost 100% of the participants involved, talking to each other, and pumped up for a successful Walk and Bike event. Please pass on my gratitude, it's good to know there are such great people out there! Radio Lollipop wishes to thank you and all of THEY IMPROV for your support in the past few years...It is through the support of people and companies such as yours that we continue to be able to provide care, comfort, play and entertainment to the children of South Florida. It was a pleasure working with you to make this event happen and I hope we will get the chance to do it again next year. In the meantime, please do not hesitate to contact me if I can be of any help. I want to sincerely thank you for everything you did to make our first murder mystery cruise a success! You went above and beyond for our event and the amount of appreciation and gratitude I have could not be said enough in this email. I have already forwarded your info to 3 different people who are interested in hosting their own event. Thank you so much again! You were beyond awesome!!! Thank you for helping with THEY improv/Tropical Punch's participation in Tickled Pink. The group was Very funny. We couldn't have done it without you. Just a note to thank you for entertaining Gilda's members at the pot luck. I appreciate your friendship and thoughtfulness. I just wanted to write and sincerely thank you for a wonderful event last Friday. THEY improv's performance was spontaneously funny and a true pleasure. Everyone is still talking about it, and I think you have gained a following from CasaBlanca! I hope we can work together in the future. Thanks again! We ended up raising money through donations through our PR for the event, so it was very successful for us. Next time, with more notice, we can really make a splash! !